As the World’s Number #1 CRM, Salesforce rapidly crops up in businesses across Australia, we are frequently asked by clients for advice around the many Salesforce job titles, what they mean, and when they’re needed. End User businesses find themselves in a position where they realise that they need resources to support the system, and have natural questions around the kind of person that they actually need. What do the job titles that they hear within the Salesforce ecosystem mean, and what do they actually entail? This is compounded further by the fact that different companies call roles different things, and so it’s important to understand the responsibilities and the tasks that come with the title itself. We understand. It’s really easy to confuse whether you’re most in need of a Salesforce Administrator or a Salesforce Developer for example, and we share later on in this series more insight around these two, and the situations where you’d hire one or the other. But first, we share with you some of the main distinctions between the most commonly used Salesforce job titles. Or Salesforce “Admin” as they’re often referred. A Salesforce Administrator is the person that provides value to the business by automating complex business processes, makes sure the system is clean and efficient and monitors new releases (these occur three times a year). Essentially, your Salesforce Admin is the SME Salesforce expert within the organisation, and they will have an in-depth understanding of customisation. What qualities will a Salesforce Administrator typically possess? Exceptional communication skills as they’ll work with people at all levels in the organisation, from the CEO to the users themselves across the business. Patient, with the ability to listen and understand customer problems, needs and issues will be useful, as will the confidence to push back on requests which aren’t in the best interests of the platform. Governance and best practice are key considerations in this role. Influential and motivating. The users across the organisation might not all be the most system savvy or keen to use the system, and so these qualities demonstrated by the Salesforce Admin will be helpful to drive user adoption. Solution focused. The beauty of Salesforce as a CRM tool is that there is no specific way of doing anything. For a single set of requirements, there could several solutions. Some people thrive in this kind of environment, others not so much. Slightly more data led than a Salesforce Admin, and sometimes the next step for a Salesforce Administrator in their career. A Salesforce Business Analyst may have experience implementing Salesforce end-to-end and possess in-depth knowledge of the capabilities and limitations of Salesforce. Salesforce BAs can be functional and hands-on, but typically work with Salesforce Administrators. The job role of a Salesforce Business Analyst requires gathering and analysing business requirements and converting them into effective Salesforce solutions that will help boost revenue generation. They also usually run, manage and analyse the salesforce implementations within an organisation. What qualities will a Salesforce Business Analyst typically possess? An analytical mindset. Being able to analyse multiple data sources in an investigative manner is important, and provide insights. A lover of all things data. Tracking and evaluating in a detail orientated manner will excite this kind of person, and they’ll be able to advise the business on what should be reported on for value-add. The ability to make decisions fast. Being able to make actionable recommendations based on data findings will be important. The ability to take the initiative. They’ll need to be able to tell the business what they need confidently. A Salesforce Developer is the API integration and code expert. Traditionally Salesforce Developers create complex workflows, triggers, APEX development, complex validation rules, AppExchange and legacy platform integrations. (Basic field, object and page layout enhancements, and also data management are tasks a Salesforce Administrator will be able to handle). A Salesforce Developer will often have a background in other programming languages such as Java and is able to advise on limitations, and has a very in-depth knowledge of Salesforce. This person is very in demand in the ecosystem and is a subject matter expert. What qualities will a Salesforce Developer typically possess? Persistent and curious. Salesforce Developers absolutely thrive on solving problems and believe that any repetitive task can be automated with code. Strong attention to detail, and pride themselves on writing beautiful and clean code which will stand the test of time. Tenacious, given that trial and error are a part of the job. A good developer will be spurred on further by something not working as it should. The ability to push back when deadlines are imposed, to make sure that all code is checked and sandboxed prior to going to production. No shortcuts taken. This particular role is more often than not found working with Salesforce partners rather than an End User, although they may be engaged by an End user for a specific project. This role is similar to the Salesforce Business Analyst role but often requires more hands-on configuration and a deeper understanding of the Salesforce platform. Salesforce Functional Consultants often come from a Salesforce Administrator background, or may have transitioned from another technology. Salesforce Functional Consultants, or Salesforce Consultants, typically work on various client projects throughout the year. They are the Salesforce champion for the client, working steadily towards them achieving their project goals. With an increasing customer base for the Salesforce CRM across the globe, the demand for Salesforce consultants is on the rise as they’re needed to drive implementation for clients. They’ll have a good grasp on the technical features and functionalities of the Salesforce platform. They’re the bridge between the client and the technical team and will often have exposure to multiple Salesforce Clouds and Appexchange products. What qualities will a Salesforce Functional Consultant typically possess? Good communication and mediation skills, and the ability to liaise between technical and non-technical stakeholders with a consultative approach where there may be conflict. Good presentation skills and the ability to demonstrate high levels of credibility to various levels of stakeholders, who are both technical and non-technical. Accountable to ensure deliverables are met both technically, and to meet client expectations, with financial implications in mind. An approach which challenges the easiest and safest way of doing things, in order to achieve the best possible outcome for the client. An innovative approach will ensure that implementations are consistently more sophisticated and efficient. A strategic mindset which hears needs and requirements which the client may not even themselves be aware of. The Salesforce Manager role can cause confusion, and we’ll explore this further later on in the blog series. We see two variances of this role in the market. The first is very hands-on and will perform all of the duties of the Salesforce Administrator role, but will take a more strategic view of the platform and may have progressed to leading a small team. The responsibilities for this role can be found under the Salesforce Administrator title, although with some management duties thrown in. The second type of Salesforce Platform Manager will be more strategic and less hands on, if hands on at all. They will manage a large team, often made up of multiple Salesforce Administrators, Developers and Business Analysts. The Platform Manager is responsible for defining and delivering all ongoing Salesforce enhancements and projects, as well as managing the team responsible for business as usual support. What qualities will a Salesforce Platform Manager typically possess? Project management skills in order to manage pipeline, demand generation, deadlines, prioritisation and process. Strong customer focus and a good understanding of order management concepts and user experience. Change management skills and the ability to react quickly and delegate. Excellent people management skills, and the ability to maintain a close understanding of workloads being distributed and constantly reassessing based on priority. A Salesforce Solution Architect is essentially responsible for designing a solution for a specific problem utilising available Salesforce products and technologies, of which there are multiple within the Salesforce product suite. This role builds and designs solutions across the Salesforce platform, typically focusing on building new implementations rather than overseeing an existing one. They’ll be extremely knowledgeable around the platform, and usually hold a large number of Salesforce certifications. Expertise would typically include Platform App Builder, Platform App Designer, Data Architecture, Sharing and Visibility Designer, Community Cloud, Lifecycle and Development Designer, Identity and Access Management Designer, Integration Architecture Designer, and Mobile Solutions Architecture Designer, giving them a highly technical overview of the capability and limitations of the Salesforce platform. They will translate business requirements into a high-performance technical solution and provide technical governance to the development team to ensure that best practices are followed. What qualities will a Salesforce Solution Architect typically possess? Big picture outlook combined with high attention to technical detail. Oftentimes growing their architecture potential from a Developer background, they will need to be able to command a group and a high-level solution. Excellent verbal and written communication to both technical and non-technical audiences, and to usually very senior management teams. The ability to project manage and delegate. The ability to build trust and credibility. Skills in influence, not only guide the team, and the client but to add value to sales pitches to win new business. Team management skills to bridge the gap between an on and an offshore team and make sure both teams are working together efficiently. A Salesforce Technical Architect is ultimately responsible at the highest level for a Salesforce implementation, and you’ll more often than not find TA’s, working for a Salesforce partner, or consultancy. As they are in such short supply, they are able to command high salaries and if they are a Certified Technical Architect, they have had to pass an extremely challenging review board, meaning they are the elite in the Salesforce ecosystem. A Salesforce Technical Architect has complete expertise on the entire Salesforce platform, may be well versed in various web development languages and will be an expert in all things Salesforce. The Salesforce Architect is a key member of the Salesforce implementation project team and is responsible for the overall technical design and build of the custom elements of a project. The Technical Architect works as a team member along with Solution Architect and supporting team members to deliver the complete solution for the customer. What qualities will a Salesforce Technical Architect typically possess? Communication skills and the ability to ask the important questions to lead the customer to success, while being aware of future plans for the platform. Presentation skills, which are finely tuned for the CTA Review Board to articulate and present very complex systems to both technical and non-technical audiences, internally and externally. As the leader of the project, a big picture outlook combined with high attention to technical detail with a skill for solving in-depth problems decisively. The main aim is being able to bring a solution to life. Leadership qualities to not only lead a team through a project but also command the respect of the client and confidence in your competency. Coaching others is a part of the role of a Technical Architect. Flexibility and adaptability. Being comfortable being able to adapt is important given that each implementation is built slightly differently, and so constantly learning is part of the role. The ability to keep calm in a less than ideal scenario but to learn from it is key. A Salesforce Project Manager is a person with an in-depth, although hands-off, understanding of Salesforce, it’s application within a business, and in particular in relation to budgets and timelines. The role of a Salesforce Project Manager is to work with developers and consultants on different projects to develop an established communication plan and build continuity through well-defined processes. The main reason for a Salesforce Project Manager to have an understanding of Salesforce despite not being hands on, is so that they can set the expectations and delivery timelines in accordance with the business requirements. Knowing what’s possible, how objects interact with each other, the implications of removing fields, and how even making small changes can affect a bigger process for this role. What qualities will a Salesforce Project Manager typically possess? Emotional Intelligence. Although a senior stakeholder may make a suggestion, it might not be feasible or won’t add long-term value to the business. A project manager with a high emotional intelligence will come from a place of understanding and consultation, where they’ll recognize the recommendation that was made, and even table it for a future project, but will empathetically convey why it doesn’t make sense to carry out that recommendation at the moment. Realism and self-management. Know your own bandwidth, and that of the team in order to be able set realistic project deadlines and budgets, to ensure that it doesn’t blow out, or burn out the team in trying to meet unrealistic goals. Be prepared to push back. Having a big picture mindset to act tactically but think strategically. Seek to understand the business impact on the project’s nuances, being in the detail understanding the grand vision. Leadership and influence. Afterall, “The P in ‘PM’ is as much about people management than it is project management.”, Cornelius Fichtner. 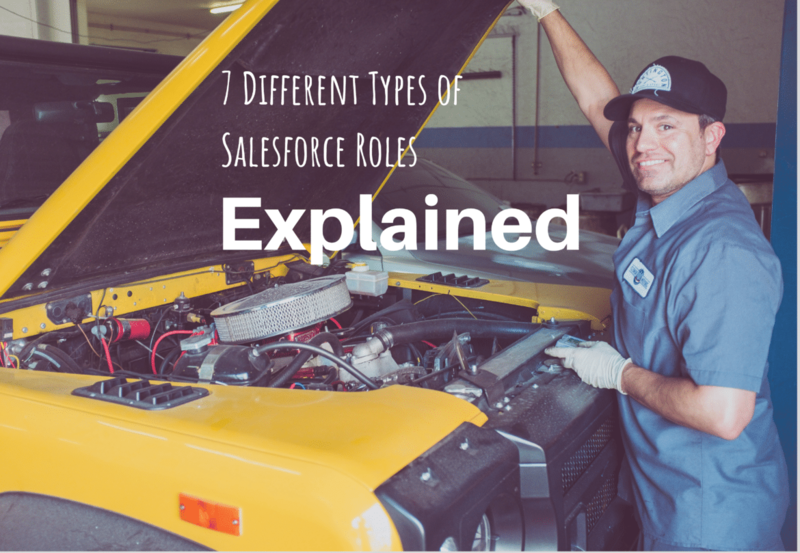 We hope these descriptions of the 7 different types of Salesforce roles have been useful in giving you an idea of what they are responsible for, and give clarity around what you need for your own implementation. We’ll be publishing further insight as part of this series, for example, into the situations you might be best to hire one type of Salesforce role over another. If there’s any particular insight you’d find useful, you’re probably not the only one, and so let us know and we’ll put some content together!